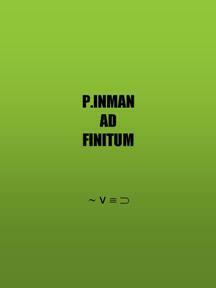 Ad Finitum continues P. Inman’s unique examination of the page, the word and the non-word. What happens when not only syntax is broken down but when words do not always label? What happens when words are beautiful? If this is your first time reading Inman get ready for a blast. If you’re already familiar with his work then get ready for a super helping. P. Inman’s books include: amounts to (Potes & Poets), at least (Krupskaya), criss cross (Roof), now/time (Bronze Skull), ocker (Tuumba), and vel (O). Ad Finitum is his first UK book publication.